Blood cells begin their life in the bone marrow as stem cells, and they mature into three main types of cells Red blood cells (RBCs), White blood cells (WBCs), and Platelets. The average human adult has more than 5 liters of blood in his or her body. Blood carries oxygen and nutrients to living cells and takes away their waste products. It also delivers immune cells to fight infections and contains platelets that can form a plug in a damaged blood vessel to prevent blood loss. Through the circulatory system, blood adapts to the body’s needs. When you are exercising, your heart pumps harder and faster to provide more blood and hence oxygen to your muscles. During an infection, the blood delivers more immune cells to the site of infection, where they accumulate to ward off harmful invaders. All of these functions make blood a precious fluid. Each year in the USA, 30 million units of blood components are transfused to patients who need them. Blood is deemed so precious that is also called “red gold” because the cells and proteins it contains can be sold for more than the cost of the same weight in gold. 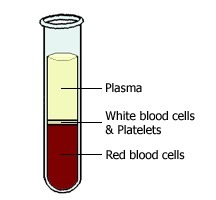 If a test tube of blood is left to stand for half an hour, the blood separates into three layers as the denser components sink to the bottom of the tube and fluid remains at the top. The straw-colored fluid that forms the top layer is called plasma and forms about 55% of blood. 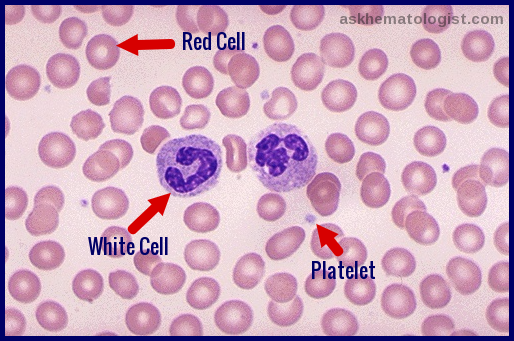 The middle white layer is composed of white blood cells (WBCs) and platelets, and the bottom red layer is the red blood cells (RBCs). These bottom two layers of cells form about 45% of the blood. Plasma is mainly water, but it also contains many important substances such as proteins (albumin, clotting factors, antibodies, enzymes, and hormones), sugars (glucose), and fat particles. 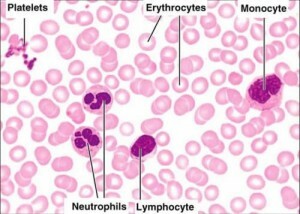 In turn, there are three types of WBC—lymphocytes, monocytes, and granulocytes—and three main types of granulocytes (neutrophils, eosinophils, and basophils). Together, these three kinds of blood cells add up to a total 45% of the blood tissue by volume, with the remaining 55% of the volume composed of plasma, the liquid component of blood. This volume percentage hematocrit is measured by centrifuge or flow cytometry and is 45% of cells to the total volume in males and 40% in females. Hemoglobin (the main component of red blood cells) is an iron-containing protein that facilitates transportation of oxygen from the lungs to tissues and carbon dioxide from tissues to the lungs. A sample of blood can be further separated into its individual components by spinning the sample in a centrifuge. The force of the spinning causes denser elements to sink, and further processing enables the isolation of a particular protein or the isolation of a particular type of blood cell. With the use of this method, antibodies and clotting factors can be harvested from the plasma to treat immune deficiencies and bleeding disorders, respectively. Likewise, RBCs can be harvested for blood transfusion. B.J. Bain, I. Bates, M. Laffan, S.M. Lewis (Eds.) Dacie and Lewis practical haematology. 11th edn. 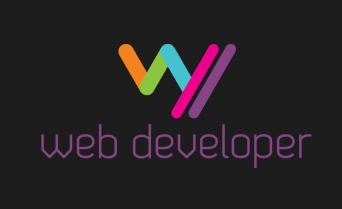 9780702034084Elsevier Health Sciences, London; 2012. R.J. Arceci, I.M. 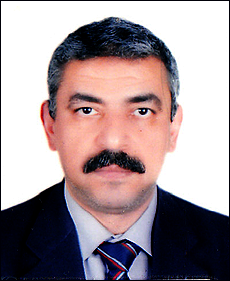 Hann, O.P. Smith (Eds.) Pediatric hematology. 3rd edn. 9781405134002Blackwell Publishing, London; 2012.